If you travel around a lot you will have noticed that in some countries it is harder to get access to your eWallet accounts than in others. There are some countries where you are not allowed to use your account. Using a VPN in those countries might be a good “temporary” solution to avoid those restrictions. Besides that, you will also increase your privacy and protect your personal data. 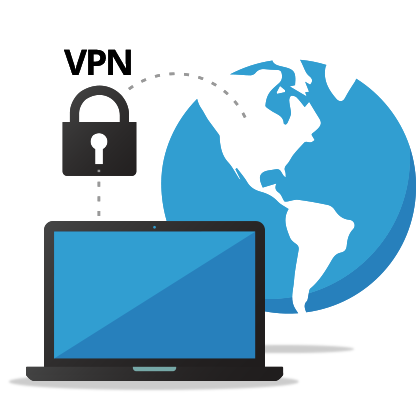 We have summarized the most important topics about VPNs on this site and we will show you what exactly a VPN is, how to easily set it up and we also give you a quick review about 5 VPN providers that we found to be good. Let’s start with some fact about VPNs. VPN Provider for eWallets – What is a VPN? 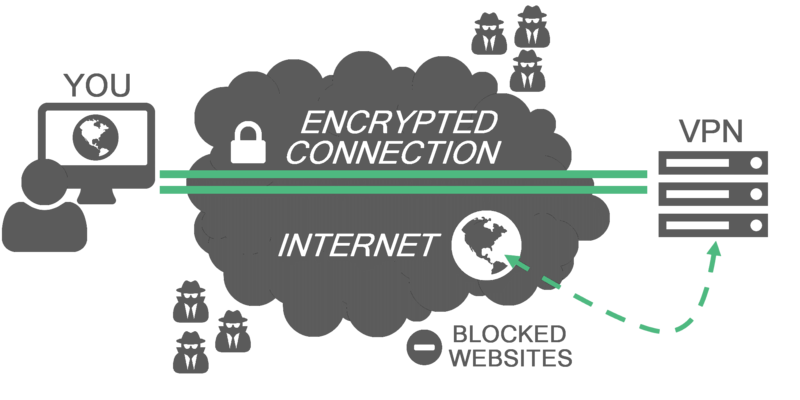 A VPN (Virtual Private Network) is closed network of computers, combined to private tunnel. This sounds a bit complicated, but is quite simple. Instead a direct connection to the internet you activate your VPN tunnel. Now all requests will be send through this encrypted VPN tunnel first and from there to the original website/address. Every website you now visit will not see your real data, they just see the data from the encrypted VPN tunnel. They are no longer able to see your real IP address and your real location. The VPN connection avoids a direct connection to your own computer and therefore the website cannot collect any data from you, only from the VPN service you are using. Most VPN providers offer different tunnels which makes it possible to choose your preferred connection (and the country where you build your connection through). Now you can access your eWallet from China and make it look like you are connecting from Germany, UK or whatever country you prefer. VPN Provider for eWallets – What do I need to use a VPN? To use a VPN you just need a VPN-Client. Modern VPN-Clients will take care of all the configurations for you, so even with little computer knowledge you will able to easily set up a client and a secure internet connection. VPNs can be configured to start together with your operating system, so once your computer is ready, your VPN is ready too. By browsing through the internet you will find some “free” VPN providers. However, we highly recommend not to use any of this free offers and only use a provider with a high reputation. All data will be send through the providers tunnel, so it is important to only use trustworthy and reliable services. HotSpot shield is a very well-known VPN provider and a great choice to improve your privacy. They also offer a free basic version, but we would recommend to directly go for the paid version (Elite Version), because there are a lot of features missing in the free version. With the elite version you will have an ad free software, private browsing, virtual locations and up to 5 devices are supported. 1 Month Plan – 11.90 EUR/month. 6 Months Plan – 3.32 EUR/month. 12 Months Plan – 2.49 EUR/month. 24 Months Plan – 2.08 EUR/month. Lifetime License – 99.95 EUR. You can pay with all major credit cards (MasterCard, Visa, Discover, Amex, JCB, Dinners Club) and PayPal. Super easy setup and daily usage. Only a few server locations. PureVPN is available since 2006 and one of the most reliable VPN providers. They are working with more than 120 servers, located all around the world. PureVPN offers an easy-to-use client, which helps you to set up the client within a few minutes and start your secure internet connection. You can browse through a list of all available servers and choose your preferred one by just clicking it. They also support up to 5 different devices, which allows you to use it on your laptop or mobile devices as well. 1 Month Plan – 10.95 USD/month + 1 Months Free. 6 Months Plan – 8.95 USD/month + 6 Months Free. 24 Months Plan – 2.45 USD/month. Another benefit of PureVPN is the wide range of available payment options. You can pay with all known credit cards (MasterCard, Visa, Discover, Amex, JCB, Dinners Club) and PayPal, Bitcoin, LightCoin and many other crypto currencies. hide.me is a Malaysian-based VPN provider with a large presence especially on the German market. Their pricing, for the premium plans, are a bit on the higher side, but they also offer some great features. They offer a lot of protocols to choose from, they offer native Android and iOS apps and they also allow up to 5 simultaneous connections. Besides their 2 premium plans, they offer a free version with a lot of restrictions, but it is still a good option to test it before you spend any money on it. Free Version (restricted in many parts). Plus Plan – Starting from 4.99 USD/month. Premium Plan – Starting from 9.99 USD/month. With more than 80 different payment options they offer almost any available options – all credit cards, bank transfer, PayPal, Bitcoin and many more. ViperVPN is a very popular VPN based in Switzerland. They offer servers in more than 73 countries and features like unlimited data usage, secure DNS servers and various auto-connect options. VyperVPN is also available on almost any device. The service does not log your internet traffic, perform any packet inspection, discriminate against devices or protocols, and it also does not throttle or limit your internet connection. VyprVPN – 5.00 USD/ month (billed yearly) – 9.95 USD/month (billed monthly). VyprVPN Premium – 6.67 USD/ month (billed yearly) – 12.95 USD/month (billed monthly). There is a 3 day trial for all plans available. You can pay with all major credit cards (MasterCard, Visa, Discover, Amex, JCB, Dinners Club) and Alipay. Top-tier plan is expensive (billed monthly). Last but not least, IPVanish. IPVanish is also a great VPN provider with a lot of servers around the world, an easy to handle client with really high security standards. They do not save a any details about your traffic and you have an unlimited bandwidth, which is important if you want to use it for things like music or video streaming services. You can use 5 simultaneous VPN connections with IPVanish. 1 Month – 10.00 USD / month. 3 Month – 8.99 USD / month (26.99 USD in total). 1 Year Pro Plan – 6.49 USD/ month (77.99 USD in total). IPVanish offers a lot of payment options. You can pay with all known credit cards (MasterCard, Visa, Discover, Amex, JCB, Dinners Club), PayPal and via giropay.